you have landed in a small corner of the art sales where sketches are sold. now don't get fooled by the sound of buying a sketch, these arts are made with as much time and care as any other art. ♥ I take payment in gems and USD paypal, no treasure. 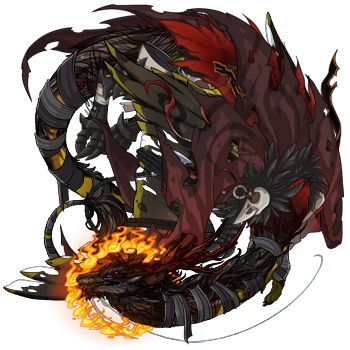 ♥ FR dragon busts only, I can attempt any breed. ♥ I won't always agree to draw every dragon ordered. ♥ I prefer to draw dragons with darker themes. ♥ payment in 1wCR which I will accept when I'm finished. ♥ I try to make the art fit within the dragon's bio by default. ♥ I draw slowly and will not draw anything with a set deadline. reminders for slow art is alright, but please do not rush me. a neat and clean sketch made with absolute care. it will have a background but upon request I can make the bg the right shade of white to match dragon bios color, that will make it appear transparent when displayed in the bio box. • priced at 500g, price can change depending on dragon's detail and difficulty. • comes with a background in any solid color requested. • art of the dragon will be filled in a single color. • I tend to "stripe shade" the lineart. • if you do not request a color scheme (monochrome only) I will make it gray.
! you are not allowed to buy a clean sketch and then color it yourself. simple as it sounds, I color the sketch I made! it can be any color you want; normally, monochrome, black & white etc. this can also be requested in the shaded option. • priced at 600g, price can change depending on dragon's detail and difficulty. • comes with a plain gradient bg by default, transparent can be requested. • may appear slightly shaded, depending on what colors I choose to use. • I may alter the hue of some colors to be more pleasing to the eye. nothing drastic, you'll barely even notice!
! you are not allowed to buy unshaded art and then shade it yourself. shading used with mainly a harder brush, but soft parts will also be blended in to give different textures and an overall detailed look. shiny parts will have highlights and maybe even sparkles. example to the right is a bit dark, details in shading is always harder to see on darker arts. • priced at 900g, price can change depending on dragon's detail and difficulty. • comes with my simple bg style by default, transparent can be requested. • the amount of detail will vary and depend on the art and dragon itself. • if you want a specific color hue of the shading, do let me know. my default is usually purple, but depends on the dragon's own color scheme. fully shaded art of your dragon to place in their bio as a banner, header, or end. • priced at 700g, two dragons can be featured in one for 1200g. • canvas size will be the with of the bio, 640 x whatever, unless requester otherwise. • it can be requested as signature size instead of bio size, 500 x 100. • comes with simple bg to match the dragon, if dragon doesn't cover all of it. • specify if you would like a certain part of the dragon visible. please choose which brush you'd like me to use when making your art. if you do not choose one, I will use soft by default. keep in mind that the price could increase depending on the apparel/skin complexity, perhaps even genes such as crystal. even so I may not agree on making everything, even I have limits to what I can do. note; I am not subbed, please ping me. most finished arts will be posted on my deviantart, unless requested not to. Q: Can I be added to the ping list? A: please add yourself, the list is self-editable for a reason and anyone should be able to edit the google doc. I will not personally add you unless you specifically give me a reason why you can't do it yourself. Q: When will you open again? A: I don't know, when I feel like doing art. could be tomorrow, or in months. simply add yourself to the ping list to never miss an opening! Q: Do you draw apparel and skins? A: yes I will try to draw all visible apparel, unless it's way too many and all clustered together in one big mess. I will attempt to draw any skin but I can not promise anything. Q: I lost my art due to X, do you still have it? A: normally (with adopts) I don't have them saved forever, but since these are special pieces of art then yes; I will have them backed up. but please still save the finished art you get so you don't have to come bug me about losing it..
Q: Can I make edits to the art I ordered? A: no, please do not edit my art. resizing the art is alright, and if my signature becomes too small to read then simply make sure I'm properly credited please. but if I missed something or you would like something changed then please let me know, I don't bite! I don't want you to be displeased in the end so I'll happily edit it for you without extra cost, however if they changes are very major then a small fee could occur. Q: Are you interested in art trades? A: that really depends on your style and what kind of art you're offering, just please don't be sad/mad if I decline your offer! @Fellefan Hi there! I tried adding myself to your pinglist, but it was set to "View Only", so I couldn't edit the doc....May I be added, please? it is? o: hm that's odd, since I see someone have already added themselves before. it really should work..
@Fellefan I was a bit baffled, too, until I saw "View Only" in the upper left. XD Works fine now, thank you! I am open for one slot! might add another one, it depends. this is not first come first serve for this first opening, I will choose which ever dragon I would like to draw. so please only post your fully filled forms. @Fellefan [b]Art type:[/b] - colored sketch, sketchy brush - [b]Dragon:[/b] Egyptian god of Centipedes! I found out about him a week ago, and I’m super excited!! [url=http://flightrising.com/main.php?dragon=50314312] [img]http://flightrising.com/rendern/350/503144/50314312_350.png[/img] [/url] [b]Key words:[/b] - centipedes, protector of the dead, mummified - [b]Apparel / skin:[/b] - centipede skin and mummy wraps on chest please- [b]Anything else:[/b] - Can I get this symbol somewhere in the background, and maybe some centipedes if you feel up to it? [img]http://www.landofpyramids.org/images/hieroglyphic-sepa.png[/img] [b]Payment:[/b] gems; have you got a wishlist at all? Egyptian god of Centipedes! I found out about him a week ago, and I’m super excited!! - Can I get this symbol somewhere in the background, and maybe some centipedes if you feel up to it? Payment: gems; have you got a wishlist at all? ooh I love egypt stuff! god of centipedes? geesh, they really have gods for everything haha. @Fellefan: Oh, your art style is perfect for this girl I have. :o I only listed apparel that I think would show up in bust-ranged illustration. She does have art from other artists in her bio, if you like looking at other references for her. Key words: Proud, confident, borderline arrogant. Anything else: Artist's choice! My only request is to make all her eyes the same color, which is a reddish orange.